A middle-class Georgia family of four making $29,500 or more per household will see an increase in take home pay. Lowers the state individual and business income tax from 6% to 4% over a three year period. Cuts income taxes by over $2.5 billion for Georgia families. Eliminates tiered income tax brackets, creating one flat tax that applies to all Georgians. Broadens the tax base to create a more consumption-based tax structure. Georgia’s tax system is antiquated and overcomplicated, and has long failed to work efficiently or fairly for taxpayers. Our state ranks as the 9th worst state for income tax according to the Atlanta Business Chronicle, and 36th in business tax climate. As a result, Georgia had the 4th highest unemployment rate in the country as reported in December 2014. The More Take Home Pay Act reforms Georgia’s overcomplicated tax system, allowing taxpayers to keep more of their hard earned income and preserving Georgia’s status as the number one state to do business. 1. Allows families to keep more of their income by lowering the personal and business tax rate. Middle-class households making $29,500 or more will see an increase in take home pay. A family bringing in the Georgia median household income of $48,000 will keep an additional $400 annually. Gradually lowers the current 6% income tax to 4% over a period of three years. No changes to income tax deductions or exemptions, such as mortgage interest and charitable deductions. Eliminates tiered income tax brackets and will do away with many tax loopholes that benefit a select few rather than the majority of taxpayers. 2. The More Take Home Pay Act encourages job growth and promotes fairness in the tax system by broadening the tax base. Like the Fair Tax, the More Take Home Pay Act replaces revenue by shifting to a broader consumption-based model. 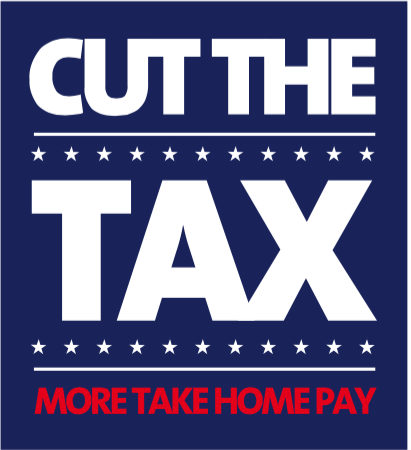 To ensure responsible budgeting and revenue neutrality, the More Take Home Pay Act proposes a low tax sales tax increase and additional low rates on stable and predictable goods like groceries, digitally delivered goods (such as downloaded software), cigarettes, and telecommunications services. Eliminates certain taxes (like franchise fees) that discourage business growth. 3. The More Take Home Pay Act stabilizes Georgia’s revenue stream. The tax base has been inconsistent and has fluctuated greatly in recent years, leaving the state budget at the mercy of the extreme highs and lows of the “Great Recession” economy. State sales tax revenues experienced a significant fluctuation in the past eight years, straining the state budget and making it difficult to adequately fund education and other priorities. Want to know more? Take a look at the Numbers and Figures, or compare taxes in southeastern states.